Friday night's Thoroughbreds For All nearly doubled in size from last year's event with over 500 attending from 28 states while raising over $12,000 for two worthy aftercare charities. The majority of the audience was made up of equestrians in town for the Rolex Three Day Event who wanted to learn more about retired Thoroughbred racehorses. The racing industry was well represented as the event was sponsored by AmWest Entertainment, Gulfstream After Care, and Three Chimneys Farm. The beneficiaries, New Vocations Racehorse Adoption Program and the Retired Racehorse Training Program, partnered to host the educational event at the New Vocations Lexington facility. The evening consisted of dinner followed by a special presentation from The Jockey Club Thoroughbred Incentive Program to recognize each of the 2013 Rolex riders competing on registered Thoroughbreds with a gift. Each Rolex rider shared their thoughts and most their preference for using retired racehorses for eventing. The remainder of the evening consisted of four sessions focused on how to choose and work with newly retired racehorses. Presenters included Hall of Fame jockey Chris McCarron, Olympic rider Phillip Dutton, Kevin Keane DVM, Steuart Pitman, and local event trainers Kathy Wieschoff and Dorothy Crowell. Eight recently off the track New Vocation horses were used during the evening, and all behaved amazingly well in front of the large crowd. Dutton worked his magic on three of the new retirees and had them successfully jumping small fences in less than an hour. Throughout the evening Dutton sang his praises of the Thoroughbred as a choice athlete for many disciplines sharing, “I just love looking at Thoroughbreds”. 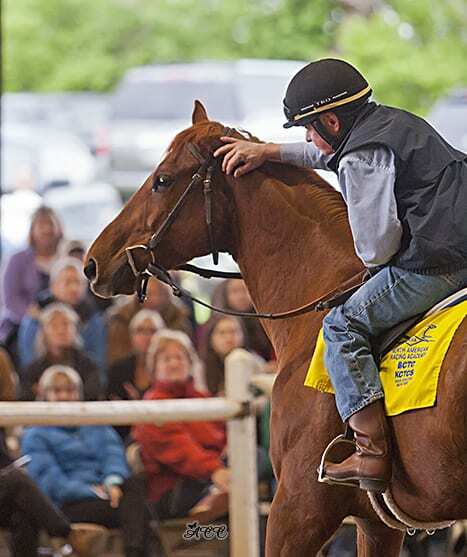 The goals of the event were to educate the equestrian public on how to obtain and work with a retired Thoroughbred racehorse as well as to raise funds for aftercare efforts. Both goals were met and the huge response proved that there is an overwhelming interest in using retired racehorses for second careers. This was seen on Friday, as well as Sunday morning when despite dreary weather nearly 200 equestrians showed up for the complimentary Three Chimneys Farm tour included with their ticket. This entry was posted in Bloodstock and tagged chris mccarron, gulfstream after care, Horse Racing, horse racing and breeding, New Vocations Racehorse Adoption Program, OTTB, ottb thoroughbred, ottb thoroughbreds, Retired Racehorse Retraining Program, retired racehorses, thoroughbred, three chimneys farm by Press Release. Bookmark the permalink.